Bangor University has retained its position among the top 350 universities worldwide for the fourth year in succession, according to the Times Higher Education World University Rankings released today (Tuesday 5 September 2017). 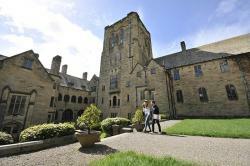 The University’s position among the world’s best universities is the latest in a number of league tables and surveys which reflect well on Bangor University. Earlier this year, Bangor University was awarded Gold for the standard of its teaching in the UK Government’s Teaching Excellence Framework, becoming the only university in Wales to be awarded the top standard. Added to this, Bangor University’s students have again, for the fourth year in a row, given the University a resounding testimonial in the annual National Student Satisfaction survey, this time placing the University eighth among the UK’s non-specialist universities in the UK and second among Welsh Universities. The University also saw success at the 2017 WhatUni Awards, with its Students’ Union Clubs and Societies deemed to be the best in the UK. Also in 2017 and as a result of its commitment to the sustainability agenda, the University was recognised by the UI Green Metric as being in the top 4% of the world’s greenest universities.